Albert-Ludwigs-Universität Freiburg, more commonly known as the University of Freiburg, is among the leading universities in Germany, respected for its teaching of law, medicine, economics, history, German studies and biology, amongst other subjects. A major part of life on campus is the radio station Echo FM, run by students for students. This was refitted and upgraded recently, with ARG switches providing the backbone of a distribution network linking several locations using RAVENNA audio over IP (AoIP) and AES67 interoperability technologies. Echo FM broadcasts 24 hours a day with a mixture of music and news gathered by its on-campus reporting team. The on-air operation is based in two studios housed at the university library, which now feature 12-fader Lawo crystal mixing desks, a Zenon Media automated playout system and a Broadcast Bionics PhoneBOX solution with social media management. The studios are linked to a central control room (located 2km away in the university’s data centre) and a machine room housing the main matrix, servers, processors and other hardware. The output of the station is broadcast from a FM transmitter on the roof of the university hospital. All sites are connected over a fibre optic network used exclusively for audio transport. This infrastructure, and the studio equipment, was installed by systems integration and distribution company SLG Broadcast. 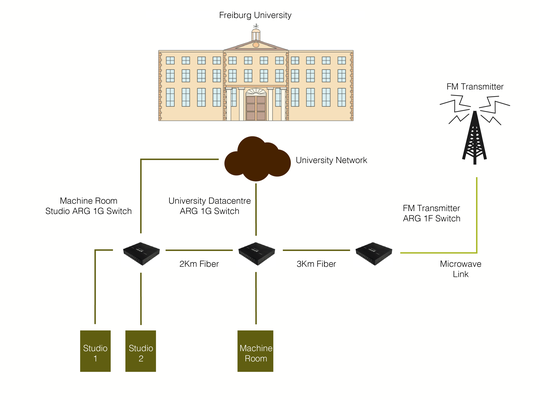 The SI selected a separate, dedicated AoIP circuit as the sole audio carrier rather than sharing the university’s IT network because Echo FM’s technical infrastructure demanded fast responses and good bandwidth with high security. Fibre optic is used as a solid connection to carry a combined audio and data stream that is real-time, linear and uncompressed. Critical to the operation of the network are three ARG 1G Quarra PTP (precision time protocol) switches, which are approved for both RAVENNA and AES67. These are situated at the machine room, the transmitter site and the studio centre. The machine room and the individual studios additionally have non-ARG switches, connected to the main network using standard data services. ARG switches embrace the technologies Broadcasters require as the evolution to fully managed live contribution over IP networks gathers pace. Whether using the public internet or mixed media IP networks ARG has the ability to provide solutions for precise timing required for remote production of both Audio and Video work flows in Live Contribution and using simple web based GUI to enable rapid deployment of complex scenarios. As a major system supplier, SLG Broadcast AG offers products and solutions for radio and TV. Its customers include not only private and public broadcasters, but also system integrators in Switzerland, Austria and Germany. SLG Broadcast supplies ready-to-use solutions as well as additional tools and sells a portfolio of selected products. The company’s offering also includes consulting in the areas of workflow, sound design and system design. For further details visit: www.slgbroadcast.com.